When we found out Suzuki had an event with a Euro-only 2008 Suzuki Swift just a short distance from Chicago we jumped at the chance to take it for a quick spin. A volume seller in Europe, Asia and other markets, the Swift has a mostly inglorious past here in the states as the almost indistinguishable cousin of the Geo Metro between 1995 and 2001. Anyone who has driven either might wonder what made us so excited about the prospect of driving this particular Swift. There are two reasons. The first is that there's more than an ocean's worth of difference between that Swift of old and this completely reworked global compact car. The second reason is that although this particular version wasn't meant for American consumption, one similar to it will be here as a U.S.-spec model. Also, I'm not crazy enough to pass on an opportunity to drive one of the only two new Swifts in the US. A little background. The event was part of a series taking place around the country meant primarily for Suzuki dealers to show off the new SX4 Sport model. Coming along for the ride is the Kizashi 3 concept car, one of the Suzuki Equator pre-production concepts and the Swift Suzuki was kind enough to let us drive. Though sporting a bright orange metallic paint and wheels of questionable origin, this car was a fairly standard mid-level version, sporting the 1.5-liter fourbanger good for about 100 horsepower. Though they have a five-speed manual version back at HQ, this particular model unfortunately carried the four-speed automatic. Until we start seeing new Fiestas or Mazda2s on the street, sporty and small Euro-style econoboxes are still a rare site. Though there are Mini Coopers and the occasional Smart ForTwo in urban areas, Americans aren't necessarily used to this quality of design from their smaller vehicles. Given that the Swift name has been used on enough rebadgings to make your head swim, the car benefits from carrying little aesthetic baggage, allowing the designers the freedom to make a car that looks sharp without having to pay homage to any of the crap coming before it. With the exception of the nose of the car featuring grille and fender work inline with the new and sporty Suzuki design language, the car can stand on its own. The high belt line, which looks out-of-place on certain small cars (we're looking at you, Chevy HHR), manages to give the Swift a larger, more athletic presence. The blacked out A and B pillars also help, minimizing focus towards that part of the greenhouse in a way that carries your eyes away from noticing just how small that rear window is. 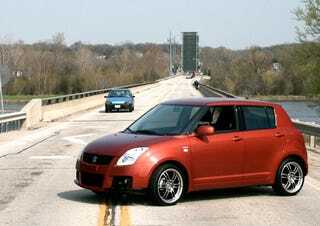 Compare this to an Aveo, which looks small from any angle (hilariously, the Aveo in Canada is marketed as the Swift). The interior is straightforward and simple, which is what you expect for a car this size. The three-spoke steering wheel isn't cartoonishly large and is even slightly sporty thanks to the ribbons of chrome-looking plastic which also support the thumb controls. The audio and climate control buttons are tiny, leaving the impression that the interior is actually larger than it is. For an economy car the materials aren't insulting and even a sensitive claustrophobic could survive a short trip (for comparison, the five-door Swift is approximately as wide and long as a first generation MINI but with a three-inch shorter wheelbase). Like many small cars this one is more fun batting around corners than down the straightaway, especially with the automatic transmission. Nevertheless, the little 1.5-liter engine features Suzuki's version of variable valve timing, allowing for a slightly more aggressive power delivery when accelerating. Tossing the Swift around a 90-degree turn at speed was no problem with the little hatch able to main sufficient traction to keep us pointed in the right direction. There's a little lean when turning aggressively, but it's nothing out of the ordinary. Over uneven roads the ride was a touch bumpy, but not enough to cause premature labor for any pregnant passengers. Braking? The Swift weighs approximately 2,400 pounds (a bit more with two souls on board), meaning the rear drums are more than able to slow us down before we go rolling off of an embankment or into another car during hard braking. In the cab on the way back to the train station my driver retold a tale of his old Fiesta. As embarrassed as he was to drive it, he says he rarely had as much fun behind the wheel. The nice thing about the Swift is it's a small, quick and most importantly for the buying demographic — cheap car that you wouldn't be embarrassed to drive. Add to that gas-sipping on par or better than some of the more thirstier hybrids and you've got a car that'll embarrass cheaper-looking alternatives like the Toyota Yaris and the Kia Rio. Just because you're on a budget, it doesn't mean you should settle for crap. If this Swift is a good indicator of the Swift to come, budget buyers at least have a little something more to look forward to.